Your Player Board represents the small piece of land you own. Good Storage Area: Store Goods until you spend them. Workers Lot: Store unemployed Workers (meeples) you've received from completed Settlers cards. Die slot: Return an Apprentice (meeple) from the main board to your Workers Lot. Construction Platform: Store Houses you've purchased from the Construction Yard. House Lot: Place Houses on these lots as part of the requirement to fulfill a Settlers card. Each lot can hold 1 House and fulfill one Settlers card. You can build a maximum of 7 Houses. Community Building Lot: Place purchased Community Buildings on these lots. Reputation track: Keep track of your reputation. It's important to keep up your good name in the City and maintain good relations with High Queen Tabita. Your reputation is tracked on the Reputation track on your Player Board. All players start with a reputation of 9. Your reputation represents the value of dice you can play in one round. You cannot place dice with a total value greater than your current reputation. Always check your current reputation before placing a die. You always roll all 5 dice at the beginning of the round and choose throughout the round which dice to use. If you take an action that increases or decreases your reputation, your new dice value limit takes effect immediately after you place your die. If a decrease causes your placed dice value to exceed your limit, it doesn't affect the actions you have already played. 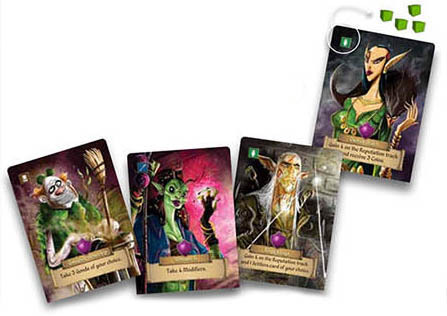 By discarding a Modifier token, you can increase or decrease the value of one die by 1. You cannot wrap around the die to turn a 6 into a 1, or a 1 into a 6. You may discard multiple Modifier tokens to change the value of a die multiple times. If you use a Modifier token, count the new (modified) value of your die when you calculate your total dice value. As your Nobility rises, you will unlock new benefits and gain additional end-game Victory Points. 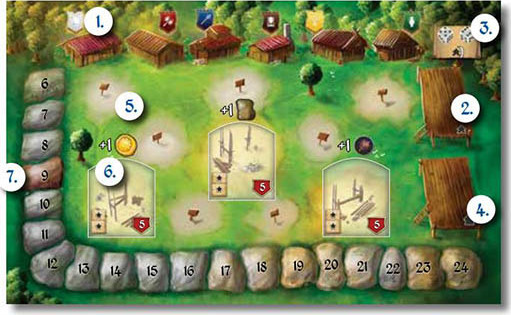 You can move up the Nobility track by completing Settlers cards and buying Buildings. Each allows you to move up one space. In order to become a Lord, you must reach level 5 . When you reach level 12 , you become a White Lord. Each player assumes the role of a landowner. There are various characters, including a local bandit, a merchant chief, a guard etc. Each Character has the ability to spend +1 Good from a certain type when completing a Settlers card. For that type of Good a player can spend 4 Goods instead of the normal limit of 3 Goods per type. This ability is available from the start of the game and can be played an unlimited number of times throughout the game. The benefit on the bottom of the card unlocks when you reach level 5 on the Nobility track. It is a one time benefit that you immediately receive when you become a Lord.